Beans originated in Central and South America, where they were commonly cultivated and consumed by indigenous peoples. Today, beans are consumed all around the world and are very popular vegetables to grow in home gardens. Outstanding members of the Fabaceae family, bean plants are slender-stemmed vines that grow narrow, multi-seeded pods in various sizes and colors. These climbers, which can reach up to 12 feet (4 m) tall, enjoy sunlight and are actually quite easy to grow in a back yard or a home garden. Before planting beans, perform a soil test in order to know whether you should mix in fertilizer or amend the soil with organic matter before planting. Beans grow best in sandy, loamy soil that has a slightly acidic to neutral pH. Do not plant beans in overly wet areas, as beans require well-draining soil. To promote good drainage, mound the soil where the beans will be planted. Since seedlings do not transplant well, it is recommended to start beans from seeds, planting them directly outdoors, after any risk of cold weather or frost has passed. Do not soak seeds before planting, as it may damage them and result in a poor rate of germination. All types of beans, except cowpea, yardlong, and lima beans - should be planted one inch (2.5 cm) deep. Cowpea, yardlong, and lima beans should only be planted 0.5 inch (1.3 cm) deep. Plant beans 2 - 4 inches (5 - 10 cm) apart. Because bean plants can grow to be quite long, use stakes, bamboo poles, or cut saplings to construct a trellis to support the vines. Install the trellis system before planting so that the seedlings or the root system do not get damaged. As the bean vines grow, train them to climb the trellis. Beans need plenty of water to grow, but perform poorly in drenched soils. Beans should receive approximately one inch (2.5 cm) of water every week. Allow the soil to partially dry between watering. When you water beans, avoid soaking the foliage, as moisture on the leaves may encourage fungal growth and disease. Depending on the soil composition, a moderate to light application of nitrogen fertilizer may be mixed in the soil before planting. However, beans will fix much of their own nitrogen as they grow, so avoid over-fertilizing. Always perform a soil test before planting to understand whether the area should be amended with fertilizer or organic matter. Beans have very shallow root systems, and tilling the soil is not recommended, since it may damage the plant. For that reason, when the vines are young, weeds must be removed by hand. Use a hoe to shallowly cultivate the soil. After the second set of leaves has developed on the bean plants, mulch with straw or leaves in order to prevent weed growth and retain soil moisture. In general, healthy bean vines are tolerant to pests. However, stressed or unhealthy bean vines will encourage insect activity. It is recommendable to periodically monitor the insect activity in the garden. Slugs and snails are common garden pests, and their activity is typically marked by the silvery trails that they leave on the ground and plant foliage. Slugs and snails may chew on plant leaves, but can be controlled through the use of beer traps or sawdust, eggshell, or copper tape barriers. Under the right conditions, there are several soil-borne fungi that can affect beans and cause root rot or damping-off. 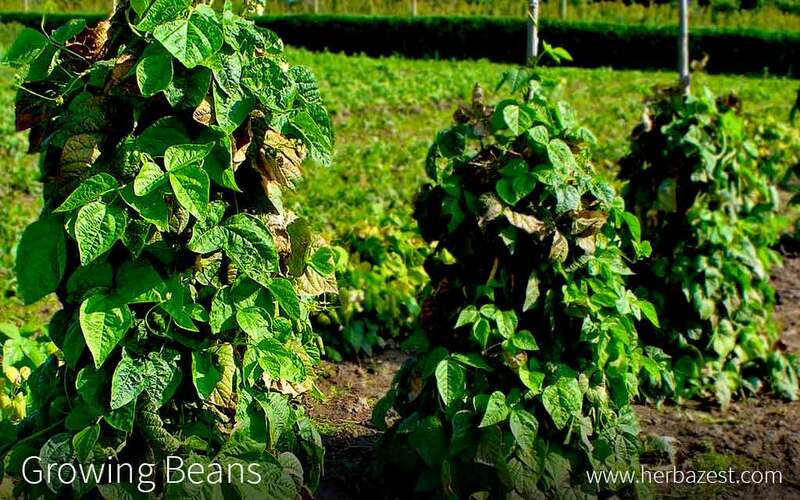 To prevent fungal diseases, do not overwater bean plants and be sure to plant them in areas with well-draining soil. Moreover, remove and destroy any debris around the beans, and practice proper crop rotation to prevent infection year after year. Beans are usually ready for harvest 50 - 80 days after planting. However, not all beans will be ready at the same time. Harvest them by size, picking the pods that are firm, crisp, elongated, and plump. Leave short, flat pods to further develop, and dispose of pods that have become overly large and yellow, as they are often bitter. Pick beans by hand and be careful not to damage the vines. Frequent harvesting of beans is important to promote the healthy growth and fruiting of the plant. Store freshly-harvested beans in a cool, humid environment, such as the vegetable crisper drawer of the refrigerator. Freshly-picked beans will last for approximately three days in the refrigerator. Do not wash fresh beans before storing them, as the moisture will promote decay. Only wash them immediately before they are prepared to be consumed. For those who are unable to use fresh beans before they go bad, beans can be preserved for future use by freezing, drying, or canning, depending on their intended use.